Today I set aside for a day trip to Macau, the island-state I also described as the Las Vegas of Asia. 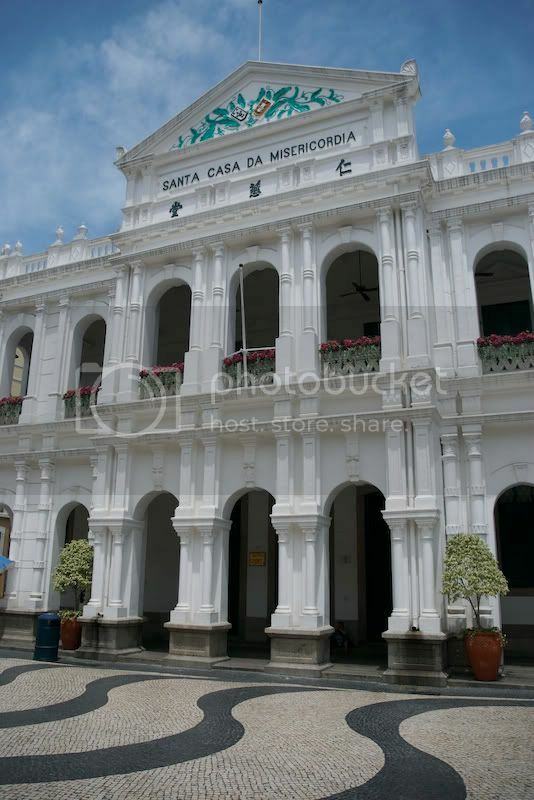 Macau was a colony of Portugal for over 400 years, and was the seat of Christianity and Jesuit missions throughout Asia. Funny how that devout background has evolved. Unable to compete with Hong Kong as a major financial market and trade bureau into Indochina, Macau gave up and instead focused on becoming world-class purveyors of gambling, opium and prostitution ? all with remarkable success. Macau was ceded to the Chinese in December of 1999, and today enjoys a special status of SAR (Special Administrative Region) as does Hong Kong. This status was negotiated as part of the Hong Kong handover, what China calls, "one nation, two systems." Interesting aside, this approach has been proposed for the "Taiwan problem", but the Taiwanese aren't having it. Because Macau is its separate SAR from Hong Kong, it does enforce its own immigration and border control. I ventured down to the ferry dock this morning, bought my ticket and was sipping my cup of Starbucks coffee while brushing up on my travel guide. When I got to the part that read, "Most visitors to Macau do not require a visa in advance?" I realized I didn't have my passport. This could be a problem as unrefundable ferry tickets are time and day specific. I went back to confirm that I did in fact need my passport, and the ticket guy said, "Yes, you do"?however, his face said, "Of course, dumbass." Then he made me a deal. If I can go get my passport and be back in 40 minutes, he'll change my ticket to Super Class (1st class) and change the time to the 11:15 ferry. I really don't know why the upgrade nor do I know why the time limit, but I suspect he relished some delight in the challenge and he probably felt at some level I wouldn't go for it. Well, I ran?literally, to the subway, across fours stops and several trains and made it back with 10 minutes to spare. He smiled, and said "You deserve it" and changed my ticket. Worse case, I would have had to buy another one for $25. But I had to get my passport anyway, the first class ride was nice and I too relished the challenge. 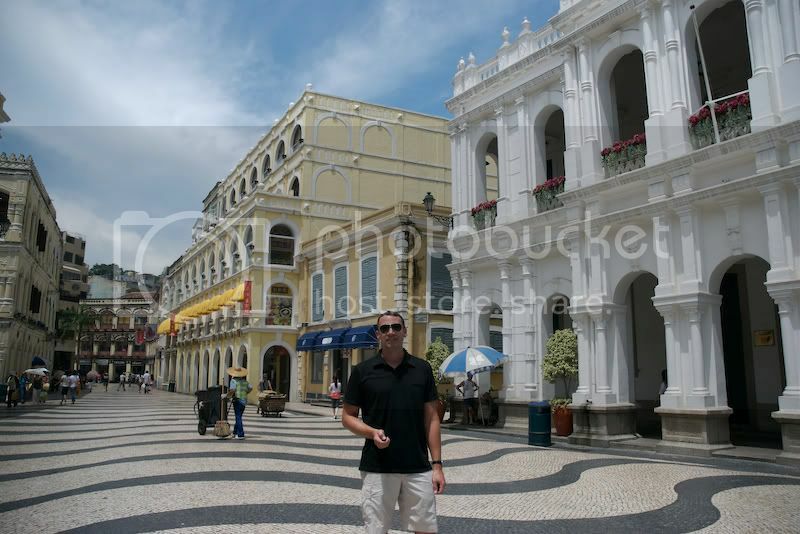 Macau has two real draws: rich and engaging Portugese history (pause for laughter) and gambling. Casinos, not surprisingly, are the real story here. Just last year, Macau surpassed Las Vegas in annualized gambling revenues. Based on what I saw, that's not going to change anytime soon. For the past 40 years, gambling was the exclusive domain of Dr. Stanley Ho. How he negotiated Macau's sole gambling license is another story. 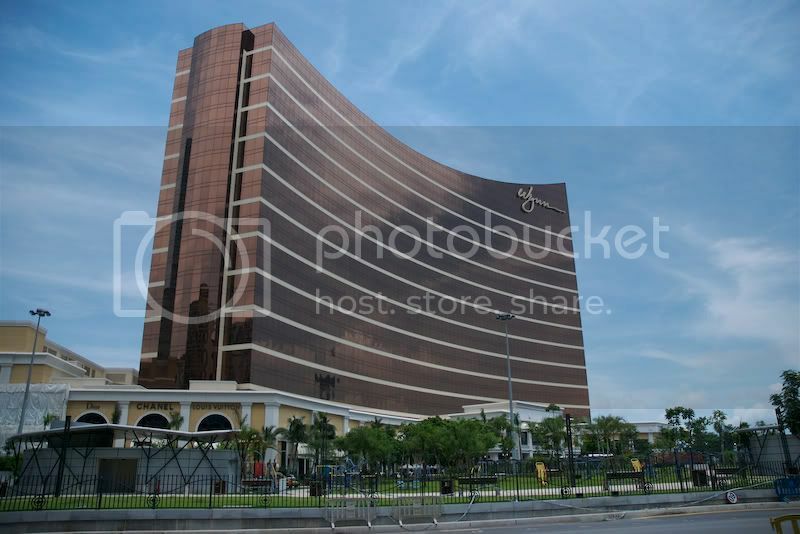 However, late last year the Macau government also granted licenses to Steve Wynn (that's his Wynn Casino at the top, looks just like the one in Vegas but not so massive), and the Sand's Resort (their property was also massive, but not worthy of a picture as it was so uninteresting). Macau is a legitimate boomtown. The economy has grown steadily around 13% per year since 2001, and the island-state will open an estimated 19,000 new hotel rooms per year over the next 4 years. If you're not a gambler, there are still some interesting things to see here. There are quite a few distinctly European buildings, plazas, churches and squares. As a whole, they alone could be worth the trip. The food is also amazing, and interesting combination of Portugese and Cantonese cuisine. (Try the African spiced chicken at A Torcha). There is one interesting street (pictured below) where the tiles are set in an interesting pattern that has a dizzying effect in person. People were actually staggering a bit. But, back to the casinos. I went to the Sands, the Wynn, and a few others. They were nice and clean and new, but not remarkable. They could be nice casinos in Las Vegas, or Tahoe or Reno or (God forbid) Atlantic City. They don't serve alcohol on the gambling floor (major points deducted), but gambling in a currency other than your own can be tricky enough. Ok, divide that bet by 7.85?. A lot of the games I didn't recognize. Which reminds me, Tod Vedock and Bob Skiba each owe me $100HK for their ill-conceived roulette wagers. My take on Macau was its good for a day trip, and certainly if you're in Hong Kong and have the time, check it out. I don't know that its worth the trip here to see on its own. But if you lived in Asia, it sure beats the trip to Las Vegas. For this reason alone, and the amount of disposable luxury dollars floating around this part of the world, Vegas should be very, very worried. I'm not sure I would recommend Macau right at the moment, but in two years its going to make Las Vegas look like Branson, Missouri.